The Maltese may look like an untouchable little glamour dog, but under that stunning white coat is a lively little canine that is full of character and ready for anything! 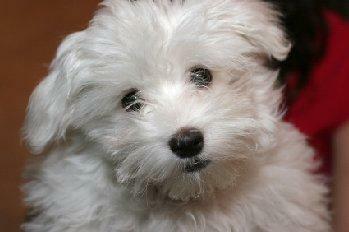 The Maltese is a popular toy dog, prized for its long white coat. The breed was originally developed on the Island of Malta, just off the coast of Italy, and it is believed the first specimens were brought back to Europe with the return of the Crusaders. These dapper little dogs became the darlings of the wealthy, where women actually tucked them into their sleeves and took them everywhere with them. Today, these dogs serve virtually the same purpose they have for hundreds of years: to amuse, adore, and infatuate their human companions. This is a very small breed, with males standing a maximum of ten inches at the shoulder. Females are slightly smaller, and weight ranges from six to nine pounds for both sexes. The coat of this breed is far and away its most spectacular feature. The color of most specimens is snow white, but shades of ivory are also acceptable. The coat is long and flowing if grown to its full length and the hair on the head is usually banded in twin top-knots, often accessorized with tiny bows. For practicality, many pet owners choose to keep their dogs in a shorter "puppy clip" that is easier to manage, however, enough hair is left on the head to create the signature top-knots. The Maltese is nothing if not lively. What they lack in size, they make up for in energy. They love to play with their toys and with each other, but mostly they love to spend time you. These dogs can become extremely devoted to their favorite human companions, so it's important to make sure they are well socialized with all members of the household. This will help prevent them from becoming overly possessive of their favorite person and snappish toward other family members. Maltese are also very intelligent and will readily learn most things you care to teach them; however, house breaking can be a real challenge. These dogs go little and often, so you really need to be diligent during the training period and provide them with ample opportunity to exercise. Some owners find that using puppy training pads provides a good, permanent solution for household accidents. This also eliminates the need for trips outside where your pet will find many ways to soil that gorgeous white coat. This is a breed that requires a good deal of grooming, even when not kept in full coat. The hair should be brushed daily with a pin brush to remove tangles before they become full blown mats. You will also need to bathe your pet on a weekly basis to keep the coat white. Otherwise, the rear legs and feet will become stained with urine, and the face will develop a reddish stain from eye tearing and food. This kind of regular grooming may be a bit much for those who have a busy schedule, but if you have the time to devote to it, grooming sessions with your pet can be extremely relaxing for both of you. Maltese are a bit delicate when it comes to their health, so you'll need to pay special attention to the following areas of care. Tooth brushing is essential in this breed. They are prone to dental disease and tooth loss, as are many toy breeds. It also helps to feed dry kibble on a daily basis and avoid too many table scraps. Drafts can lead to respiratory problems, so take care to limit your pet's exposure to cold and damp conditions. Slipping knee caps are common in this breed, so be very cautious about letting your dog jump down from the furniture. Eye ulcerations are also somewhat common for this breed. The head fall tends to come loose and winds up rubbing against the corneas, irritating the tissues until scarring begins to form. If treated quickly with eye drops, most ulcerations will clear up, but it's very important to keep the hair away from your pet's eyes. To look at a Maltese is to fall in love with it, but you need to consider whether you can offer one the kind of care and attention it needs to thrive. These merry little dogs need plenty of companionship, but that attention is better coming from adults than children who may not completely understand just how delicate these dogs really are. The Maltese is not meant for the kind of rough and tumble play that a Cocker Spaniel can endure. As mentioned previously, the amount of grooming needed may also be a draw back unless you find you truly enjoy this one-on-one attention with your pet. If you understand the care needs of a Maltese and you're willing to meet them, you'll not find a more loving canine companion to share your life with.